Pei-Wen Liao, a young violinist, has won numerous international and national competitions, and has also performed with many different orchestras in many concerts, benefits and recitals. She made a debut recital in Carnegie Weill Hall only at the age of thirteen with sold-out tickets in 2007, and has already made her Italy, Russia, Korea, Mainland China and Japan debut. From mid-December 2009 to early January 2010, Pei-Wen made her Mainland China debut by performing as a guest soloist with the Manhattan Symphonie on a National Concert tour for 9 concerts which included Beijing, Hangzhou, and Tianjin. Pei-Wen received critical acclaims and was well-received on both the news and other media. The Yuyao China Times wrote the following of one of Liao’s performances with the Manhattan Symphonie: "The Chinese Butterfly Lovers’ Violin Concerto, which had the most receive from the audiences, was played by a young virtuoso, 15-year-old violinist Pei-Wen Liao, who led the audiences to the open mouth position for which she phrased the Butterfly Lovers’ Concerto so beautifully that includes musicality, technicality and everything." In the summer of 2009, Pei-Wen made her Japan debut by performing as a guest soloist with the New York Asian Symphony Orchestra on a concert tour in Kanazawa, and the Tokyo International Forum Hall, for which she received critical acclaims in both media and news. Pei-Wen was also invited by the Music Association AGIMUS to perform a full recital in Padova, Italy in February, which was a sold-out recital and a standing ovation. In April, Pei-Wen made her Korea debut by performing with the Seodaemun Symphony Orchestra at Continental Hall in Seoul, Korea. In July, Pei-Wen was once again invited by the Sun international Company to play a full recital at the Taipei National Recital Hall with sold-out tickets. Pei-Wen was also invited to play a recital on a Strad Violin at the WMP Concert Hall in November. In October 2008, Pei-Wen made her Russia debut by performing with the Voronezh State Orchestra under the baton of Mak, Ka-Lok at the Voronezh Philharmonic Hall, and also with the Lipetsk Philharmonic Orchestra at the Lipetsk Theater in Russia. In February 2008, Pei-Wen performed with the Arlington Philharmonic Orchestra as a soloist at the Arlington Town Hall, for which she was featured on the local Arlington news. In March, Pei-Wen was a winner again of the Juilliard Pre-College Violin Concerto Competition, for which she performed as a soloist with the Juilliard Pre-College Chamber Orchestra at the Peter Jay Sharp Theater. In June, she was the Absolute prizewinner in the violin category and Second Grand prize in the 6th International Competition of Classical Music, for which she was broadcasted by local television. In July, Pei-Wen won the 1st prize at the violin Category of the 6th International Competition “PREMIO CITTA’ DI PADOVA” in Padova, Italy. In July, Pei-Wen performed three concerts with the American Air Force Band of Liberty in Boston. In August, she was sponsored by the Sun International Company to play a full recital at the Taipei National Concert Hall with sold-out tickets. In November 2007, Pei-Wen made her Carnegie debut recital at the Weill Hall with sold-out tickets; she performed as a soloist with the Manhattan Symphonie and also performed a recital program at the second half of the program. She was well-received by the audiences and reviewers. In May 2006, Pei-Wen was one of two winners at the Juilliard Pre-College Concerto Violin Competition, for which she performed with the Juilliard Pre-College Chamber Orchestra in a tour concert at Maryland. Pei-Wen is also a winner of many other competitions, including the 10th New York Music Competition, the Bachanalia Young Artist Competition, Arlington Philharmonic Competition, and Young Baroque Artist Competition, etc… Pei-Wen had also played in master classes for Anne-Sophie Mutter, Michael Frischenschlager, Glenn Dicterow, Aaron Rosand, Joseph Silverstein, Mikhail Kopelman, Nina Beilina, Sergiu Schwartz, and Hu Kun. Pei-Wen was born in Taipei, Taiwan R.O.C. 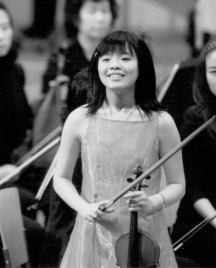 Pei-Wen began violin at age five. She also started playing the piano at seven. She also plays viola and composes. Pei-Wen entered the Juilliard School Pre-College Division in 2004 with scholarships and is currently studying with Stephen Clapp. Pei-Wen’s violin is kindly loaned from the Chi-Mei Foundation.